Fear and sadness shone through Jasmine Richardson’s eyes as spectators sniffled and wiped away tears. Using an African accent, the 21-year-old senior leader of GCU’s inaugural speech and debate team shifted from conveying the lip-quivering despair of a victim, to the savagery of a machete-wielding killer — balancing multiple voices and postures with a message about forgiveness. Richardson’s prose interpretation piece was based on the harrowing autobiography “Left to Tell: Discovering God Amidst the Rwandan Holocaust” by Immaculée Ilibagiza, who survived the 1994 genocide in her native country by hiding for 91 days in the tucked-away bathroom of a local pastor’s home. Richardson, who graduates with a communications degree this spring, performed her gripping portrayal Friday during a campus showcase at College of Nursing and Health Care Professions. Other pieces addressed human trafficking, domestic abuse, the depiction of mass murder in the media, and social anxiety. Earlier this month, the team led by first-year communications instructor Barry Regan won the Division III National Championship in Individual Events at the National Christian College Forensics Invitational held in California. Richardson was among the students who earned honors, and, by finishing in the top three at enough events this year, she qualified for the American Forensic Association national championships to be held at Arizona State University on April 4-7. Richardson and several members of the team also will compete in the April 17-21 National Forensic Association tournament in Michigan. Richardson plans to use her interpretation of Ilibagiza’s story at ASU as she competes against the best collegiate speakers in the country. “She tells the story of redemption, and how she came to terms with forgiving the people who killed her family,” said Richardson, who was born in Nebraska but grew up in central Phoenix and attended Central High School. Ilibagiza “credits her salvage mostly to prayer and to a set of rosary beads given to her by her devout Catholic father prior to going into hiding,” according to the author’s website. After the three months avoiding detection, she discovered that her parents, two of her brothers and other relatives were among more than 800,000 people slaughtered. Ilibagiza — who became a U.S. citizen last year — emphasizes in her books and public appearances how faith, prayer and forgiveness can help propel people through the darkest times of their lives. At Central High, Richardson said she was the second high school freshman in the history of Arizona to qualify for a national high school forensics competition. She competed once at Harvard University and broke into the quarterfinals in a dramatic interpretation event, in addition to cracking the semifinals in poetry as a freshman at another national competition. The segregation-themed novel “Roll of Thunder, Hear My Cry” by Mildred D. Taylor served as a key piece for Richardson at the time, and she continues to focus on minority rights in her college studies. She plans to return to GCU this fall to work on her master’s degree in special education with the hope of advocating for marginalized groups such as special-needs children, the elderly and racial minorities in her career. After attending Phoenix College for one year, Richardson transferred to GCU and was one of two students on the original speech and debate team led by communication professor Jessi Farmer. Regan established the new speech and debate team last summer. The 12 students on the team already have competed in a range of collegiate competitions this school year. Each earned $2,000 scholarships to participate in the program, although they range in majors from communications to business. 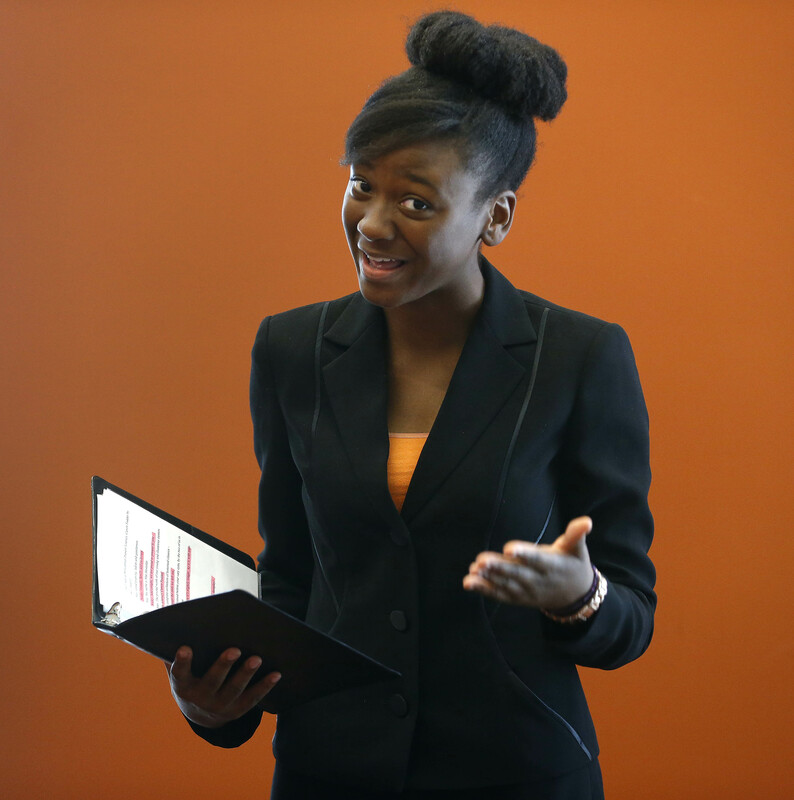 Regan emphasizes research, preparation and other foundational principles of public speaking as students prepare to compete in a variety of speech and debate styles. Half the team focuses on speech competitions such as persuasive, prose interpretation and after-dinner speaking, while the other half tackles issues through prepared or impromptu debate styles. Junior JilliAnna Davis said she was thrilled to learn that GCU was starting a speech and debate team. She hadn’t competed since high school but said she has learned more about conveying messages to a mass audience. Alixis Russell, also a junior, said she has discovered public speaking as a forum to share the grim realities of human trafficking trade — the focus of her Friday persuasive speech. “I’m just very passionate about my platform … I just want to bring awareness to the issue in any way that I can,” Russell said. Regan said Richardson has a natural ability for conveying messages with words and physical action. At a competition in San Diego, one judge admitted being “moved to tears” by Richardson’s Rwanda piece. In addition to the Rwanda piece, Richardson will compete in communication analysis at ASU. Her speech addresses black hair-care products and women’s chemical straightening of their hair into a Euro-centric style as an example of co-culturalism.